I’m sure our readers recognize this trio of names and know that they started off as one of the quintessential reggae vocal ensembles, The Wailers. After over ten years together, sharing the hard times and the lean times, and also after a critically acclaimed debut recording, Burnin’, the bond of friendship fractured. There are any number of theories about what the centre couldn’t hold—I’ve no interest whatsoever in doing an autopsy. What I’m interested in is the magic that all three would come out with sterling albums in the same year. Moreover, while there is no doubt that Bob Marley is not only the major name in reggae, also he is unarguably the leading composer of reggae music, nevertheless, I am not alone in considering Bunny Wailer’s Blackheart Man the superior of the their respective 1976 recordings. Peter Tosh was basically a polemicist, whether urging the sufferers to “Get Up, Stand Up” or urging the political establishment to “Legalize It,” Tosh had a way of writing hooks that summed up the feelings, beliefs, dreams and realities of the majority of the Jamaican people. But Tosh didn’t have Bob’s thematic range nor Bob’s penchant for memorable melodies. All of which is why I rank Tosh in third place in the 1976 derby—and regardless of what anyone might think today, back then every reggae fan could not help but compare and contrast this particular trio of recordings. Bob’s Rastaman Vibrations is a good record. In fact, for most artist this would have been a great album, but we’re talking Marley and there were stronger albums to come over the next half decade before Marley’s 1981 death. All the trademark Bob Marley elements are here but the album does not sound groundbreaking. If you had asked me in 1975, my predictive ranking probably would have been Bob or Tosh first and Bunny a distant third. And, boy, would I have gotten it all wrong. Bunny Wailer who refused to leave Jamaica, came back with the most folk-oriented, most rootsy recording of the trio. Rather than hard like Tosh or popular like Marley, Bunny dropped a deeply spiritual recording that drew on folklore and religious liturgy. This may be the most spiritually-oriented of all reggae recordings, especially in that Bunny Wailer embraces both rasta and non-rasta. The Christian references are as pronounced as the deep rasta. Moreover, the vocal arrangements are ethereal as though recorded while Bunny was in a deep, deep trance. This album would not be out of place if played in a church service. All of the issues are addressed from a moral perspective, even the overtly political themes stress spiritual steadfastness. 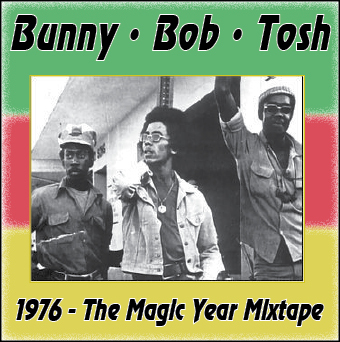 When I was sequencing the Mixtape I noticed how both Tosh and Bob’s tracks all start with distinctive trap drum pick-ups, heavy hitting, distinctive patterns that kick-off the proceedings. Bunny often starts his songs with a solo instrument, softly offering a melodic prelude rather than a hard drum drop. Plus, Bunny places the drum set well back in the mix. In fact, sometimes the hand percussion is louder than the drum set. On just that count, Blackheart Man has a totally different sound. This was a rope-a-dope reggae record. While the other two came hard, sticks and stones hard, Bunny replied with water. His sound was cooling, cleansing and refreshing. Regardless of the ranking, the fact that all three major albums dropped within the same year is an absolute wonder and a testimony to the talent of each member of the former trio. Such a bounty of three strong recordings from three former comrades presented at the same time never happened again, not by Bunny, Bob or Tosh, but also not by any other parts of a former major group whether in reggae, jazz, popular music or any other genre. This was truly a magical musical moment.